The Tibetan Terrier is a medium-sized dog breed with a long-haired coat that is either straight or wavy. Dogs of this breed are affectionate, sensitive, playful, and a bit needy. TTs socialize well with kids and other pets, have moderate to high maintenance needs (including frequent grooming), and are typically suitable for first-time owners. 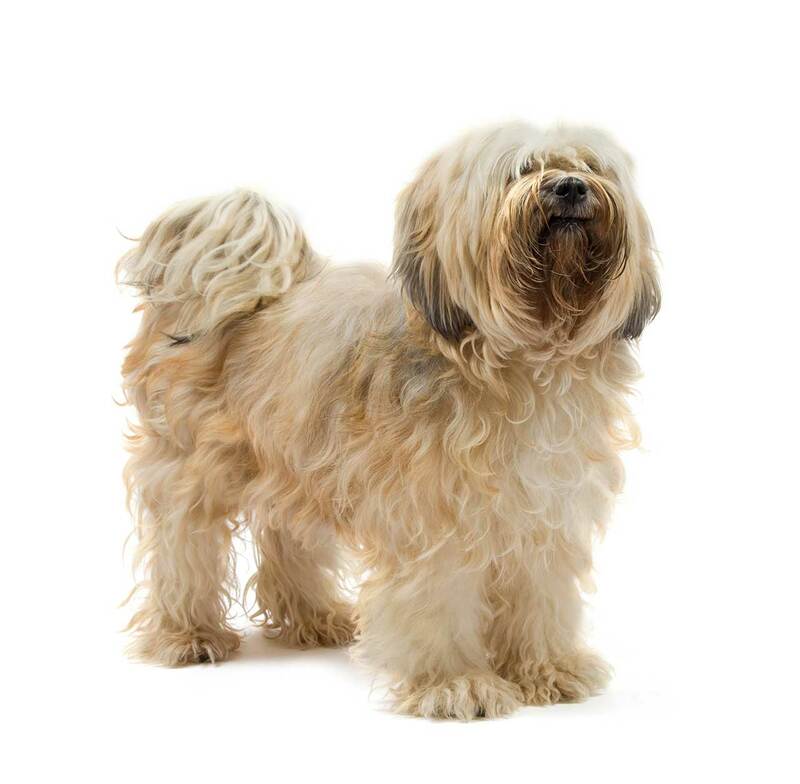 Some general Tibetan Terrier information: dogs of this breed are medium-sized (15 inches at the shoulders in height, 22 pounds, on average), with beautiful, silky coats in a variety of colors that often resemble human hair. They're extremely personable and loyal, spirited, and very healthy overall. TTs will need a moderate amount of exercise, and a great deal of grooming. These dogs are fairly intelligent and are generally easy to train, and are extremely willing please, so they're pretty good at learning commands. Since TTs were raised by monks in ancient times, they were known as "Holy Dogs"--and the name fits in several ways! These dogs are sensitive, caring animals (they're employed as therapy dogs often), and their presence can seem to have a calming, healing effect on humans. They also have large, flat, rounded feet, so they have amazing balance; legends of TTs walking across the backs of sheep (much like walking on water!) are commonplace. On the other hand, owners who are constantly cleaning up their Tibetan Terrier's shed hair might just give up. Needless to say, dogs of this breed are not hypoallergenic. TTs are normally quite active and playful; as smaller medium-sized dogs, they're not overly strong or athletic, but they are active and sporty, and usually fare well in competitive trials. 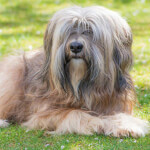 Tibetan Terrier history dates back some 2,000 years. The breed is one of those rare ones that, due to a number of circumstances, is believed to be as pure as the driven snow. While the name correctly states the region where the dog was kept, Tibet, the "Terrier" part is incorrect; these dogs are not Terriers. They were thought to be Terriers by Westerners who first saw the dogs in the very late 19th century. There may be a great amount of privately held accounts of these dogs, but as the dogs were kept in monasteries in an isolated area north of India high up in the Himalaya Mountains, there is very little history available. What is known was brought back by early modern Western adventurers. These dogs were highly prized by the lamas who kept them. 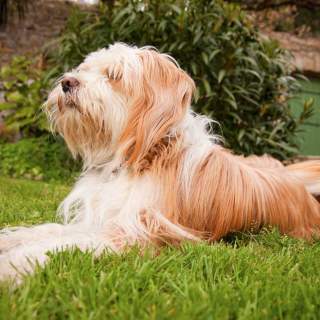 There have been DNA tests that prove the Tibetan Terrier is descended from the most ancient dogs, and that they were responsible for a great many other breeds such as the Lhasa Apso, Tibetan Spaniel, and Shih Tzu. As these dogs were able to perform many tasks, they were and are known by many names: Holy Dogs of Tibet, Little People, and Luck Bringers. Tibetan Terriers would walk across the backs of sheep in narrow mountain passes, retrieve items that had fallen down steep cliff sides, and help watch over and guard the flocks and property of monasteries. They were never sold, but they were occasionally given as gifts to people. One of those people, an English surgeon named Dr. A.R.H. Grieg, was given a female Tibetan Terrier named Bunti in 1922. She later got a second one, a male named Rajah, and with these two she had foundation stock in the Western world. By 1924, she had a litter on her hands, and they were formally called Lhasa Terriers. 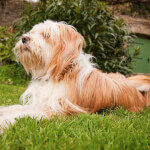 Six years later, in 1930, the breed's name was changed (by the Kennel Club of India) to Tibetan Terrier. Some years later, in 1956, a couple named Dr. Henry and Alice Murphy imported some of the dogs to the U.S. and founded Kalai Kennels. In 1957, Alice Murphy helped to establish the Tibetan Terrier Club of America. By 1963, the breed was being allowed to participate in AKC shows. 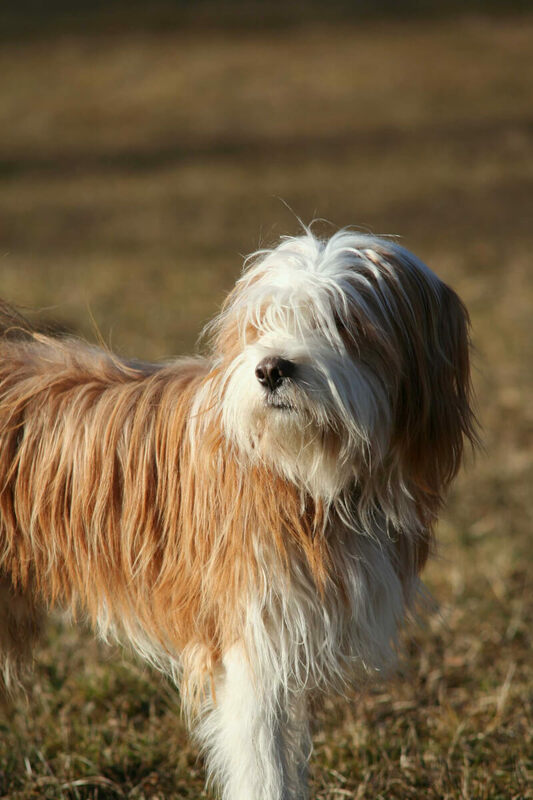 A decade later, in 1973, the AKC formally recognized the Tibetan Terrier. 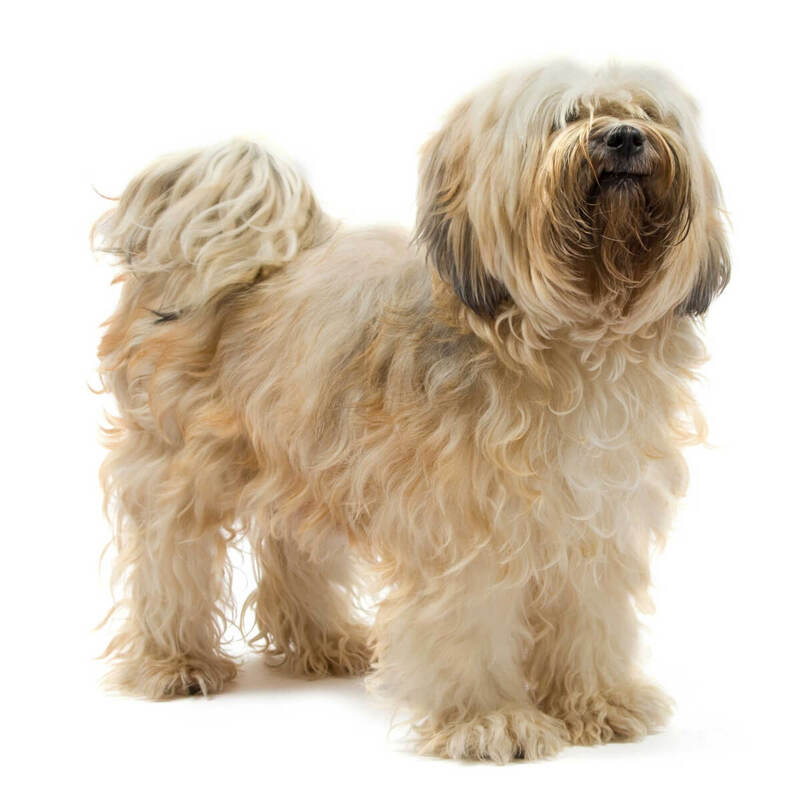 The smallish medium-sized Tibetan Terrier is squarely built; most eye-catching about this breed's appearance is its attractive, profuse long-haired coat and abundant facial furnishings that makes it resemble a miniature sheepdog. In regards to physical structure, a TT is typically about equal in length and height. The head is oval-shaped, the muzzle is of moderate length and width, the eyes are round and brown, and the ears are long, rounded, and hanging; abundant hair covers the ears, eyes, and muzzle. A TT's chest is quite broad, its back is level, and its legs are fairly short, with the hind legs slightly longer than the front ones. A unique feature of this breed is its feet, which are flat, broad, and hairy between the toes. (The feet act as natural snowshoes in snowy conditions, and make these dogs excellent climbers.) The tail is of medium length, hairy, and curved, and is often arched over the back. As previously mentioned, the Tibetan Terrier coat is its most prominent feature. The coat is double-layered, with a dense, curly undercoat and a long, thick topcoat; the outer hair, which resembles a human's, can be wavy, but is most often straight. And interestingly, at around one year of age a TT will replace its "puppy coat" with a more luxurious mature one; the dog will shed even more profusely during this period. Dogs of this breed have coats in a wide variety of colors; the coats can be solid, brindle, dual-colored, or even tri-colored. One common coat pattern is a darker color on the upper portion of the TT's body, and white on the lower portion. A black Tibetan Terrier, for example, may have black hair on its back, face, sides, and legs, and white on its chest, underbelly, and feet. Solid colors are least common. An all-white Tibetan Terrier (or gold) is rare. Tibetan Terrier size is on the low end of medium. Height for both sexes is 14-16 inches at the shoulders; Fully grown Tibetan Terrier weight is 20-24 pounds. The Tibetan Terrier has little variation in physical structure within the breed. Individual dogs of this breed may have slightly differing features like ear, muzzle, or tail length, but these are naturally occurring, and don't qualify the dog as a breed sub-type. The same goes for the Tibetan Terrier coat: double-layered, with a dense undercoat and a long, fine outer coat. Tibetan Terriers with short hair do exist, but are rare, and those dogs are probably crossbreeds. In regards to a TT's facial furnishings, there is recently-discovered genetic evidence of a mutation in the gene responsible for the facial hair, meaning the occasional dog may have little or no facial hair. This genetic mutation is rare, though, and applies to all dog breeds with facial furnishings, not specifically to the Tibetan Terrier. Tibetan Terrier size, too, is fairly consistent; practically all TTs average 15 inches at the shoulders in height and 22 pounds in weight. 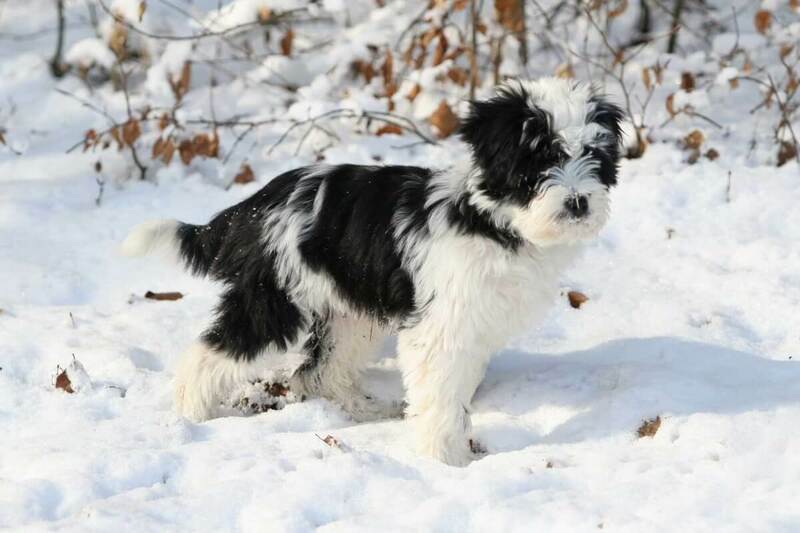 Some breeders may offer small or "Miniature Tibetan Terriers" for sale, and while those dogs are indeed smaller (as little as 10 inches in height, 15 pounds in weight), they are either the products of disreputable breeding methods or simply crossbreeds. Toy Tibetan Terriers are also probably crossbreeds. The typical Tibetan Terrier has a temperament that displays affection, intelligence and sensitivity; dogs of this breed are playful, energetic, and adaptable, but they are often quite "mouthy"--barking is one of their favorite pastimes. 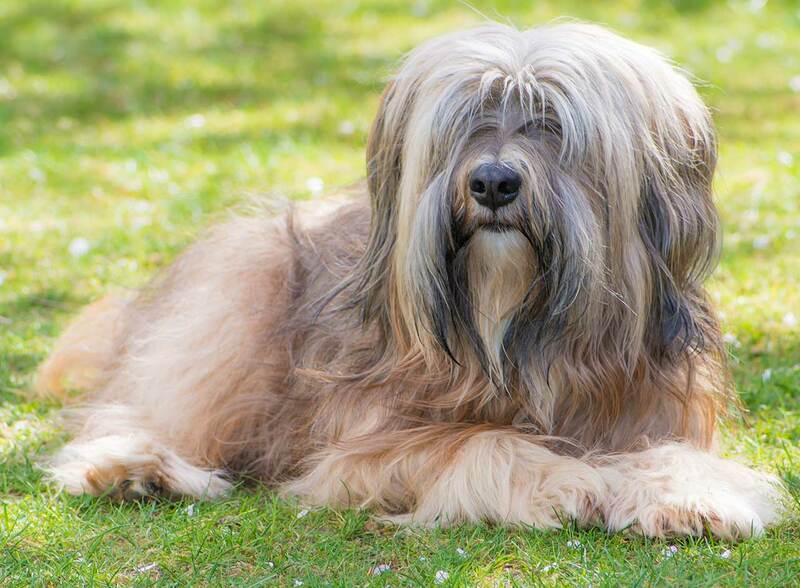 Even so, the Tibetan Terrier characteristics and personality make them fantastic human companions, and they are extra-sensitive to their family's needs. (These dogs are often utilized as therapy dogs for that very reason.) But a Tibetan Terrier will usually expect to receive love as well as giving it; these dogs are known for suffering separation anxiety, and will bark (non stop!) or turn destructive if ignored. If provided with enough attention, though, dogs of this breed will be nearly ideal family pets. When it comes to training, these shaggy little guys usually respond well; their traits of intelligence plus willingness to please makes them fairly fast learners. Typical positive, reward-based training methods work best for these dogs. And one advantage to a mouthy dog breed? When combined with an instinctive curiosity, it makes the animal a terrific watchdog. Tibetan Terriers are normally a bit suspicious of strangers, so TTs will definitely bark to alert their families when confronted with unknown sights or sounds. 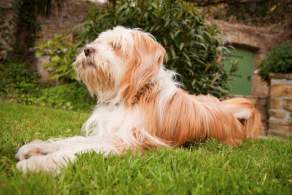 Below are pictures and images of the Tibetan Terrier. While Tibetan Terriers are good-natured, sensitive family companions, owning this breed may cause a few headaches. A Tibetan Terrier sheds profusely, barks frequently, and prefers the company of its human family. A TT can conceivably live outdoors (and has a thick enough coat to withstand extremely cold temperatures), but will much prefer living inside with its humans--it is a companion dog, after all! Dogs of this breed suffer separation anxiety if left alone; they will bark (and bark, and bark!) and even become destructive if they're ignored or left cooped up for extended periods--and will do the same if they're left outside all the time. And as previously noted, these dogs shed a great deal; "Tibetan Terrier" and "hypoallergenic" aren't even in the same ballpark. And TTs shed their entire coats at around a year of age while their "mature coats" grow in, so expect hair everywhere during this time. Dog groomers suggest brushing TTs' long, fine hair almost daily; they also recommend spraying the coat with water from a spray bottle (mixed with conditioner, if you prefer) to minimize shedding and tangles or mats. Tibetan Terriers are extremely healthy and hardy dogs overall. Even so, dogs of this breed may suffer eye issues like Progressive Retinal Atrophy (PRA), lens luxation, cataracts, or distichiasis (ingrown eyelashes). Other potential health problems include hip dysplasia, patellar luxation, and hyperthyroidism.